“My IQ is one of the highest…and I am a stable genius”. The Google search curiously seemed to be delivering up a kind of antonym usage instead of the synonym I expected. But of course the contrast got me thinking about the nature of most politicians and their rhetoric. I think I get this guy’s method. He’s a New Yorker, and so am I, and I often prove it by some ridiculous boasting. And of course in this case the guy is also a bit of a showman, and I don’t think he always believes some of the things he says. In my work as a filmmaker, I have encountered many people who praise their own skills, promote their own genius, so that others will join them on a project they are trying to produce. The kind of over-the-top bragging that you hear coming from the President is actually pretty common in the world of entertainment, and business. 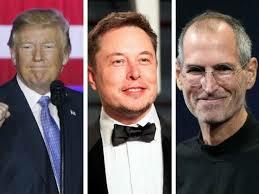 Look at Elon Musk, and even Steve Jobs, who no doubt relished being called a genius as he tried to steer Apple to astonishing success. But…but. I don’t particularly like the ways of that world, and oftentimes after meeting with such people in the film industry I feel like I need to take a shower to wash off my association with that mentality. It is so different, isn’t it, from the way of Jesus? Today’s Gospel is all about the radical difference that Christians are meant to make in the world. In the Gospel James and John are very attracted to Jesus and want to be with him, want to become his ‘lieutenants’ and perhaps share in the power and glory they misperceived he had or would soon possess. They even ask him straight out---let us be your best friends to your right and to your left—because they knew that he was going to become something really big one day. But they didn’t understand the kind of power Jesus possessed or the kind of ‘celebrity’ they would share in if they were truly at his side. Like so many others, they misunderstood who Jesus really was. And Jesus sees their vanity, understands their misplaced desires. So he tells them that the glory they are seeking will be completely different than what they expect. To be with him will mean being despised, rejected, ridiculed, shamed, abused, and ultimately killed. To be with him will mean spending your life with the hungry, the thirsty, the naked, the imprisoned, the broken and abandoned, the powerless, those suffer in sickness and in death. To be with him will bring no glamour, no fame, no prestige or material riches or worldly rewards. To be with Jesus will mean that they will have to take on his heart, his all-embracing heart, and forget about themselves and their dreams of personal glory. Quite a bit different, isn’t it, from the message of the leaders of our world today? What is true success all about---for our nation, for our city, for ourselves? Are we so different from James and John? Don’t we fall into the same trap they they initially did with Jesus? I have to tell you about an experience I had, visiting a couple I didn’t know very well, except for a few hellos in church. They asked me to bless their home, and so there I was one Sunday afternoon. It was an older home in a section of the city where people of modest means are able to find affordable housing. With the little they had, the home looked comfortable and welcoming. Cathy opened the door with a smile, clearly happy to see me there, holding my holy water bottle. As I entered, her husband appeared from another room. He looked like a guy who worked outside, his skin tanned and lined. He held out his hand and when we shook it felt like rough leather--the kind of hand you get from labor, not sitting at a computer. As the couple glanced at each other it was clear that they shared a deep and trusting love. I sat down on a couch and we chatted for a few moments. I didn’t know that all that well and wanted to learn more about their lives. They asked me about my work in the parish, and about my teaching at the university. Cathy volunteered that she worked as an aide in a preschool program, and she gestured to her husband. “Joe works for the city.” she said. Joe smiled, a little embarrassed. “It’s not that interesting,” he said. I told him he was the first person I knew to work for the Sanitation department, and I always wanted to know what it was like. Cathy jumped in again. She was smiling, happy to brag. “Joe is the best garbage man in the borough. He can stack more garbage on the truck than anyone else. He gets so much in one truck that they don’t have to make as many runs.”. It felt like she was ready to award him a medal on the spot. I immediately thought about all the garbagemen that I had seen on the streets of the city, jumping off the backs of the trucks, lifting the heavy cans of garbage into the waiting compressor. So many times I’ve wondered how they felt about what they were doing. And I’ve thought what my parents would have said to me if I had announced my desire to have a career in the sanitation department. I looked at Joe. He was really sincere. I was really touched by his humility and grace. She paused for a moment and walked toward Joe. “I have always been proud of him and always will be. I don’t think the job makes the man. I believe the man makes the job! And I love my garbage man.” I looked over at Joe. “God loves garbage men too, doesn’t he?” he said, a big smile on his face. Yes, he does, I said. Yes, I think God has a special love for those who pick up the garbage after all of us. God has a love for all of our brothers and sisters who labor and struggle unnoticed in the world, and maybe especially for those who have lost little ones along the way. Cathy passed the framed photo in her hands over to me. “Can you bless him, too?” she asked. Of course, I said. And then we went around the little house, room by room, blessing kitchen, bedroom, bathroom and living room with holy water and spontaneous prayer. On my way home, I listened to latest news and heard more political bragging and celebrity gossip. I prayed that God will bless our nation with humility and with that the Holy Spirit will remind us of God’s special love for the little ones among us. Like shining from shook foil.